As I sit here at my desk, drowning in the emotions of Kate Bush’s vocals I try not to think about the torrent of exams I have to face next week and beyond. I know that as long as I do my best then no one can ask for more. The post below was written as a practice essay for English Language, the stimulus being “don’t get me started on”. This style of writing is intended to provoke a reaction in the reader, be it positive or negative. I would rather receive heaps of criticism and know I’d struck a chord – albeit a rather out of tune one – than have my writing shrugged off as lacking in passion. In some ways this is the continuation of my first ever blog post, written two years ago, which discussed in somewhat less detail the many negative aspects of the Topshop experience. Topshop, like other popular retailers, can be easily defined by its clientele – those who shop there – and its target market – those the brand would applaud for stepping over their threshold. The Topshop Girls (or clones, depending on how strongly opposed to the chain you are) can often be seen congregating on patches of grass in the centre of University Campuses; blackberries clutched in one hand, ‘Topshop Make Up’ bags dangling from the crook of their other arm. Don’t think I’m getting on my high horse – I have a blackberry and it’s incredibly useful – but I don’t utilise it as a fashion accessory. One of these individuals will have been entrusted with the act of selecting a suitably skimpy floral outfit which the remainder of the contingent will have been required to observe before clothing themselves in a variation of the same ensemble. In a nutshell, the more items purchased in a shop with a name beginning with the letter ‘T’ the better (just to clarify that’s Tiffany & Co, not Tesco – too easily confused, I know). It’s female peer pressure which channels itself into a bizarre spectacle of consenting uniformity; a sad but nevertheless honest reflection of some corners of today’s society. The cunning sales technique employed in every Topshop from Oxford to its giant flagship store on Oxford Street has no doubt been the most profitable idea to emerge in the last twenty years (apart from Google and, erm, Apple but that’s by the by). Grown women morph into wild animals upon the arrival of a new collection and God forbid Kate Moss collaborates with Topshop again or she’ll have the blood of many a shopper on her hands; death-by-stampede. The alpha male of last season’s Limited Edition capsule wardrobe is indisputably squabbled over; the statement Christmas party dress which was probably held up on the pedestal of Topshop Boutique until it’s price was slashed. Not even the instincts and rivalry displayed on the plains of the Serengeti could match the ferocious scenes of fracas on Boxing Day morning when the fashion food chain really comes into play… The top predator is the thirty-something marketing manager who replaced potentially child-shaped holes with clothes several years ago and who stops at nothing to gain internal workplace promotion – even if it means a four-figure yearly wardrobe. The primary consumer is the proactive student out looking for a bargain which she’s likely to achieve given that she is welcome to a ten percent discount when using her NUS card. She’ll know what she’s here for but will lack that scary, “in at the kill” attitude others possess. The producer on the other hand is, very aptly, the expectant mother or mother with baby in tow. I would advocate the plastering of warning signs all over the entrance to the shop in a heartbeat, bearing the message “KEEP OUT unless you are willing to lose an eye for an eye(catching cardigan)”. To summarise: Topshop is unsafe unless you are a) trained in the art of combat, b) the owner of a pair of particularly pointy elbows or c) very, very determined to purchase something your were too much of a cheapskate to last month. On a more serious note, I know that I am not alone in having been embarrassed by the sizing Topshop deploys. I see myself as a healthy teenager and, although I’m not a stick insect, large I most certainly am not! It therefore worries me that, being the size twelve or fourteen in Topshop that I am, there are girls out there shimmying into size sixes. We can joke about how they should be given the benefit of reduced prices considering how little fabric the garments they buy are created from, but I can see how little things like this could lead to allegations of encouraging eating disorders of anorexia – irrespective of whether or not the brand actually is. I could have ended up a Topshop girl if it wasn’t for the guiding hands of several people who pulled me away from the bright lights of the Manchester Arndale and down the un-crowded streets of the Northern Quarter – the vintage Mecca of the North. Whilst I acknowledge the act that we can all be permitted a couple of pieces in our wardrobes I feel very deeply that we are, as a nation, in acute danger of getting sucked into a vicious spin-cycle of lazy, over-priced and clique-induced fashion. I know that the day when I feel a thrill when handing over any amount of money in Topshop will signal that it’s high time the men in white coats come and drag me away. I’ll probably be wearing a slogan t shirt reading: “I left my soul at the sales desk”. Lots has happened since my last post – my wrist has healed, I’ve been off galavanting in London and my Summer has officially begun! But I don’t want to leave any posts unfinished which is why I want to complete part 2 of my previous post ‘Sunday Girl Part 1’. Now I am at last physically able to tell of my attire and where all the pieces were sourced from I shall! I bought the dress new, from Next, last Summer. Originally it was a light blue colour (giving the impression of being denim when it’s actually cotton) but I hadn’t had much wear out of it so back in April I decided to dye it dark blue, and since then I’ve worn it so much more! The scarf in my hair was handed down to me by my Mum (so I suppose it’s vintage!) and the blue socks you can barely see were £3 from Topshop – one of I think three purchases I have ever made from that shop, to see why read my first ever blog post. 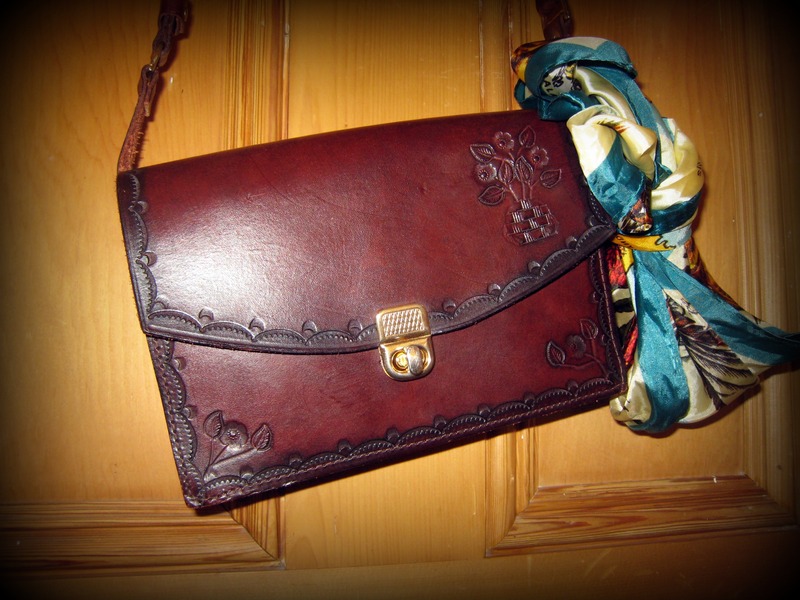 The beautifully crafted bag made from re-worked leather was a present and can be seen in more detail in my post from February entitled The Beauty Of Leather, in which the silk scarf tied around it also features. 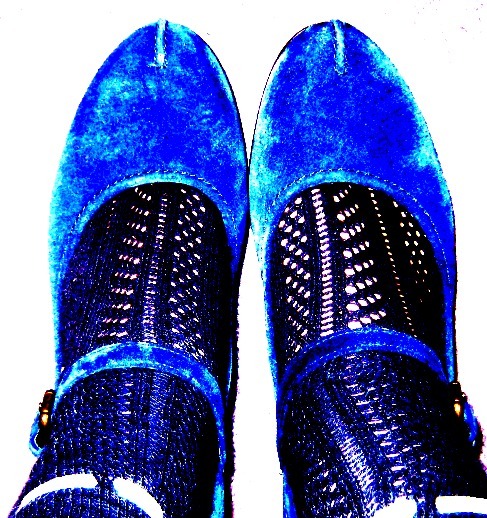 The blue shoes (which are suede – well spotted Roz!) were one of my best ever buys and I found them nestling in a corner in the Clark’s January sale. They were marked down from £60 to £15 and being real suede on the outside and real leather on the inside I just couldn’t resist! 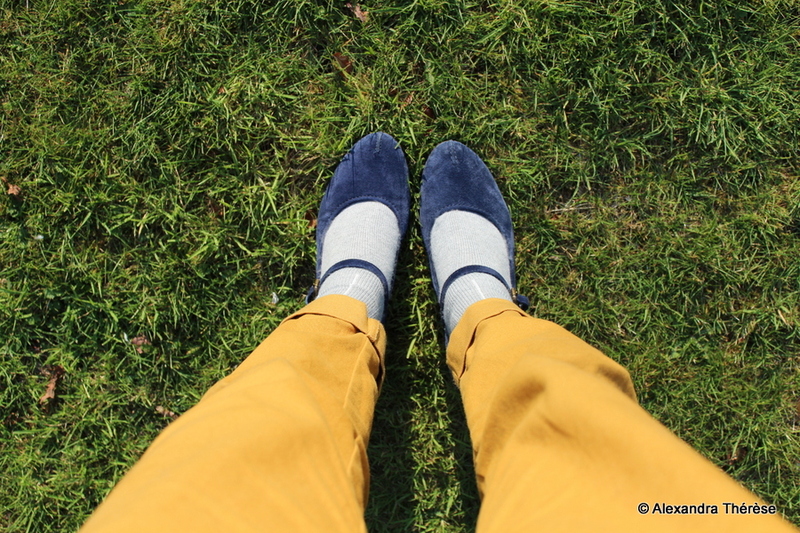 In fact, I love them so much that they were featured in their very own post, Blue Suede Shoes, in March. I’ve heard and read many times that you should judge a man by the shoes he wears. That doesn’t actually have anything whatsoever to do with this post but it seemed to be a good opening sentence. What this post is really about is how a pair of shoes can have the ability to either make or break an outfit. This is a problem that I have quite often as I am not a person who has a whole rack full of shoes in every colour shape and style imaginable. I have size eight feet which is often a problem when shoe shopping as there aren’t many retailers who actually stock size eight plus shoes and those who do often only sell a limited range. This being the case I like to buy shoes which I know will last a while and be versatile. For example, I don’t know what I would have done without my Fly London boots this year as I have worn them to death! Being black they go with just about any outfit and as they are patent and have a rubber wedge they are versatile enough to work with a smart-ish dress or just casually with a skirt or trousers. The £45 I paid for them was perhaps the most well spent money in the history of my wardrobe and they have been a staple item ever since I bought them over a year ago. This is all very well, but so far there has been no reference to the title of this post you may think. 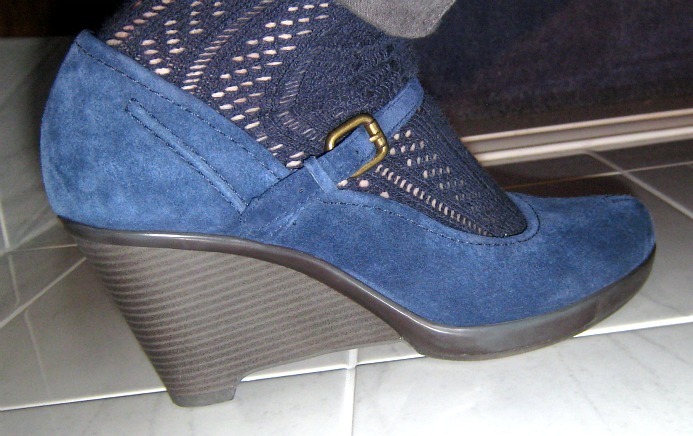 Well, in the last week of January I went for a mooch in what was left of the sales and found myself in Clarks trying on a rather delectable pair of blue suede wedges. They were marked down from £60 to £15, were real leather on the inside, were exceptionally comfortable, fitted me perfectly and I could actually walk in them. Sold! Extreme Editing! I just love the vividness of the blue when the colour is so saturated. Note: the blue socks I’m wearing with the shoes were £3 from Topshop and are one of the three Topshop items I own (the other two being pyjamas and a blue knit dress). I generally don’t tend to buy things from Topshop as I have some issues with their sizing and pricing (have a read of this post for a proper explanation) but for £3 I thought that the socks would look pretty with mary janes, and indeed these blue wedges. It’s now getting to that time of year when leaves start falling, the central heating’s turned on, and a jacket/coat is essential to every outfit simply for the necessity of keeping warm. This season’s catwalk has boasted at least three major outer-wear trends, these including: the cape, the trench the leather/sheepskin aviator and the fur coat. I am a big fan of all four of these pieces, but it’s not in my power to go out and buy them all off the high street, let alone the designer versions! This said, I have been deliberating as to which to buy as my statement outer jacket/coat for winter. Let’s start with the cape. As you may have read, this summer I acquired a wonderful black, full length ’40s cape from a vintage boutique. I am delighted to tell you that the cape in question had its first outing yesterday. 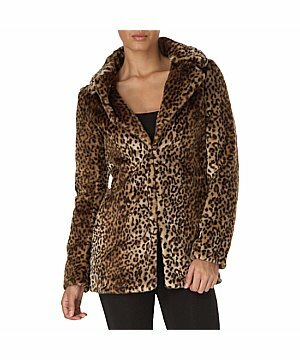 Last night I went dancing, but it was cold and windy so I wanted something warm, with layers I could take off and put on when required. I went for black tights and my black leather Fly boots, with a red ’60s style dress over a black rollneck sweater. Add to that a some bright red lips and a matching beret, and with my cape on top I was good to go! I got quite a few funny looks, and I reckon some people thought I was in fancy dress. However, I did receive some lovely comments on my outfit, especially the cape! 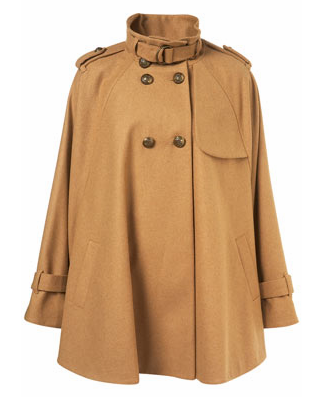 Taking all this into account, I just can’t justify buying another cape (if I were to it would be the Ultimate Cape in camel from Topshop). Next, the trench. I LOVE trench coats. But I already own two, both black, and, again, I shouldn’t spend £80 on a camel/green/blue/red/grey trench when I can easily make do with the two lovely trenches I already own. Now that would be being frivolous on my part. 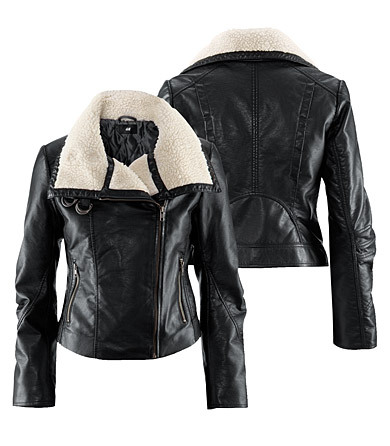 I really like the black leather and sheepskin aviators, and although I already have a brown leather jacket, I wouldn’t want to customise it into a sheepskin (and anyway it’s brown not black) so I think I might have to but myself the H&M version for £24.99 which seems pretty reasonable (although it isn’t real leather, or sheepskin for that matter!) Not all of us can wear the Burberry Prorsum versions, and anyway, they were probably sold out about three months ago! This brings me to the (faux) fur coat. I don’t own a fur coat and never have. But I intend to own one very soon. I have seen quite a few versions in New Look, Topshop, River Island, Zara etc but I’m not sure which to go for yet. I was considering hunting out a vintage fur but I don’t fancy wearing anything moth-eaten so I might just stick to a high-street version. I’ll see what I can find. Also, if anybody has seen any fur coats that they think are particularly great, then please comment and insert the link as I am open to suggestions! Playsuits. Bright, pretty and fun. Everything that summer should be. I must admit that I had reservations about these particular items of clothing when they first made their way onto the high street at the start of the season. I think my misgivings were more to do with the fact that the weather in the UK at the time was just generally horrendous and any thoughts of sun had long since fallen from our minds and the fact that one of the first playsuits I spotted was a Topshop creation – rather than dislike of the actual playsuit idea and design itself. Now the sun has re-appeared and there are outlets other than Topshop for playsuits; I am very willing to give them a go. There are plenty of flowery numbers available nice and cheaply in places such as New Look and Primark, but I decided I was going to retro and buy a ‘real’ playsuit – vintage style. So off to Cow I went (of course!) and soon enough found THE playsuit for me. This is what I love about Cow – they collect all of their stock together from a particular fashion from a particular era, and style it in correspondence to what look is currently in. I did not end up with your average flowery playsuit. Oh no. Instead I picked out a fantastic royal blue 80s playsuit with white arrows and stripes splashed across the front. It is without sleeves – it simply has three white straps on the shoulder and the upper arm to prevent it from falling off. It is rather unconventional as it wraps round the back and ties in a bow at the front. It is fantastic and I LOVE it. Playsuits are great. You know why? It’s because, realistically, if you wear a playsuit – the only other item that is absolutely necessary is a pair of shoes. Obviously you will want to accessorize with a bag, a hat, some sunnies and jewellery – but if you’re in a rush simply shove on a playsuit, grab your sandals and go! One piece outfits are so much easier – that’s why I love dresses so much! So if you haven’t already got one, go and buy one now. If you don’t fancy going straight into wearing a playsuit or if you are leg-conscious; go for a jumpsuit first. The same as a playsuit but with full length leggings that will bunch in on your ankle – ideal for if it isn’t hot enough for a playsuit. I won’t even suggest a particular shop as they are EVERYWHERE. But if you want an authentic, retro one – get down to your local Vintage Quarter before they all go! For those of you who don’t have any nearby vintage shops – then there are loads of online vintage shops and eBay is excellent. Many high street stores are channeling the retro feel too. Argh!!!! I end up having this brief conversation with other girls far too often. The slightly depressing thing is that when I hear that the particular garment is a Topshop purchase, it is automatically lowered in likeability in my mind. Don’t get me wrong, Topshop bring out brilliant collections and they know how to sell them – but what you get for the prices you pay isn’t worth it. Who would pay £60 for a dress when you could go into H&M and buy a similar version for say, £24.99? Another thing, which healthy, average size teenagers want to be subjected to the humiliation of having to take sizes 12/14 into the changing rooms as you can’t even begin to pull up the zip on that gorgeous dress even though it’s a size 10 (which you normally are) and have to stand looking at yourself in the mirror realising it’s so tight that not even your slender, 8 year old cousin has a chance of squeezing into it? Add to that emerging distressed and exhausted from the Topshop sale rail with one hanger holding a £20 t-shirt that you realise you don’t even want that much and you just grabbed it off the rail as that annoying girl rifling through everything had her heavily made-up eyes on it. And people wonder why I don’t venture into Topshop. It’s fine to have the odd piece in your wardrobe, but what I’m saying is we shouldn’t get sucked into this lazy, over-priced fashion. Buying clothes should be fun and not expensive – handing over your £40 in Topshop for a cardi that you might only wear twice this summer doesn’t give you anywhere near the thrill of finding that little gem of a scarf in your local market or charity shop for only £2 – especially when you know the money is going to a good cause. In fact, handing over any amount of money in Topshop has never given me any thrills at all. A student, blogger and future journalist with a love of fashion, reading and performing arts, I am determined to spend every day with pen and paper in hand. Alexandra Thérèse showcases original writing and photography, the former being an evolving spectacle of thoughts, opinions and persuasions and the latter a newly undertaken adventure. Writing on politics, current affairs, culture, feminism, education and literature I am currently hoping to read English Literature at University. Click to receive new posts by email from Alexandra Thérèse!